Polio was one of the most dreaded epidemic diseases in history and claimed countless lives. It was the ingenuity and determination of Dr. Jonas Salk that resulted in the creation of the first safe and effective polio vaccine. But, who was the man behind the cure? 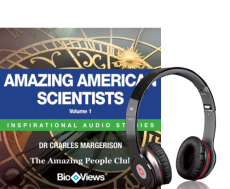 You can explore his inspiring life story and the life stories of four other amazing scientists in this unique collection from The Amazing People Club. Percy Spencer was a pioneer in the chemical synthesis of medicinal drugs from plants. He was also the first African-American chemist inducted into the National Academy of Science and received over 130 patents for chemical discoveries during his life. The collections of life stories about amazing scientists offer a unique insight into some very different aspects of the fields of science. The equally amazing life stories of William Shockley, Percy Spencer and Percy Julian are also explored. Each story comes alive through BioViews.